The six paths and four lives are split asunder, as Itto Ogami and Daigoro become separated in one of this series' most powerful stories to date! The Lone Wolf's arch-enemy, Yagyu Retsudo, pursues Ogami to retrieve the secret letter stolen from him, only to watch dozens of his men fall victim to the Lone Wolf's hungry sword! But Yagyu drives father and son apart as they tumble down a cliff and must survive on their own! Little Daigoro must begin his honorable search for his father. 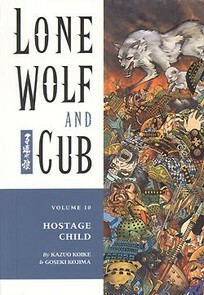 But with Yagyu's henchmen hunting high and low for the Lone Wolf and his cub, the net drags closer and the danger wraps tighter, but the blood flows ever freely!